In last week’s column I argued that the music of Silver Mt.Zion pierces the dystopian realities we currently face and offers hope for more utopian ways of living. Whilst I noted the beauty inherent to their music, my primary argument rested on the lyrical content of their songs and the communal styles of singing they employ. This analysis- and indeed my previous explications in this column- rests on the centrality of the voice in music. In the words of Csaba Toth, I presented these vocalisations as ‘the logos as truth…constitut[ing]…the ideal point of a politicised voice by claiming to speak the truth of its audience’s situation’. With the music of Silver Mt.Zion, I would extend this to argue that the beauty inherent to their music seeks to represent the beauty which can be present in human interaction and is waiting to be freed in a communal utopia. In today’s column, however, I want to abandon the truth claims of representational musics to focus on a different kind of utopian music: free improvisation*. Improvised music may not appear utopian at first glance. Indeed, if the term ‘utopia’ is understood in the way that I used it in my first column (on Talking Heads’ Heaven,) as referring to a society which denies difference and becoming in the name of perfection (a philosophy I call ‘State Utopianism’, following Deleuze and Guattari’s concept of State thought) it seems thoroughly antithetical to the term. Yet since the early twentieth century the concept of utopia has increasingly come to refer to prefigurative, immanent spaces highly tolerant of difference and embracing what Susan McManus has called an ‘ecstatic openness’ to an unknowable future. There has also been a trend- particularly in utopian fiction- away from utopias of hierarchy (in which a ‘visionary thinker’ plans and oversees the utopia) to more anarchist, horizontal utopias made and remade by all those who inhabit them. In my academic work, I draw on these developments alongside anarchist political philosophy and the writings of Gilles Deleuze to develop what I call a ‘nomadic utopianism’. The nomadic utopia is a communal space akin to what Deleuze and Guattari have called a ‘schizophrenic object’: an object which cannot be conceived of without relation to the processes of production which produced it, and which continue to (re)produce it. It remains a utopia only inasmuch as it remains open to the future. It is my belief that a group of people engaged in improvising music constitutes such a nomadic utopia. At this point, I wish to more thoroughly think through the concept of the ‘dividual’ that I introduced last week. Against the notion of the individual (who is to be opposed to the collective), the dividual is simultaneously a unique person and utterly embedded in social relations. Furthermore, they are dependent on those social relations for their uniqueness. It is only insofar as the dividual effectively builds on these social relationships that they have a capacity to change the world. Whilst I do not wish to claim that improvising music will ‘change the world’, I do believe it offers a microcosmic example of how dividuals may revel in their difference and engage in creative production free from hierarchy. 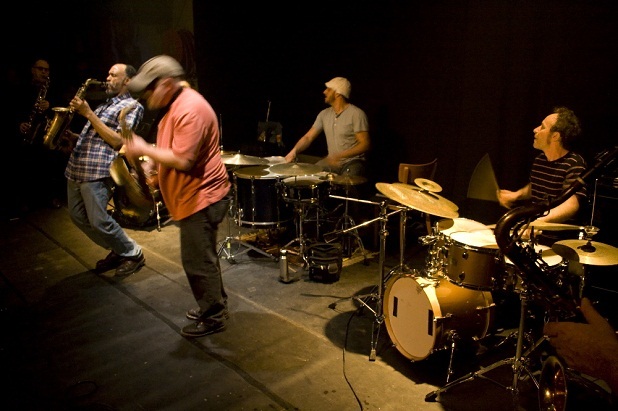 Playing improvised music in a group requires that you listen to what everyone else is doing and react to that through asserting your difference via your own playing (difference in this sense being constituted by the dividual improviser’s musical technique; the music they are- perhaps subconsciously- influenced by and so reproduce; the instrument they are playing; their mood; their physical state…): ‘to be fully a part of the crowd and at the same time completely removed from it’, as Deleuze and Guattari might say. In a successful free-improvising group, no hierarchy will emerge from this relationship: to listen and react does not mean ‘to be dictated to by’, and the listening constitutes a circular set of relations which the trombonist George Lewis has characterised as ‘multi-dominance’. As a practicing improvising musician, I can attest to the stunning power (in the sense of puissance: creative power, or power-to; rather than pouvoir: hierarchical power, or power-over) that flows from this multi-dominance. To speak in Nietzschean/Hegelian terms, to improvise freely is to exist in a utopia populated purely by masters- there are no slaves to dominate and so no hierarchy requiring negation (Nietzsche, of course, dismissed anarchists as being slaves characterised by ressentiment: a hatred of those capable of expressing what I am calling puissance). Seeing free improvisation in this nomadic utopian light throws up resonances with what I believe are some of the most interesting forms of political organisation going on right now. On a much larger scale, the Zapatista movement’s rejection of hierarchy and vanguardism- exemplified by their claim that ‘we make the road by walking’- speaks to the value of the nomadic utopia as ‘schizophrenic object’, whilst an excellent recent article on the Guardian’s Comment Is Free website asserting the continued relevance of Emma Goldman stresses that anarchy is most effective when it is seen as an unending process and not a State Utopian telos at which mankind should aim (it may seem odd to use the term ‘State’ in conjunction with anarchism: here I am following Saul Newman’s excellent appropriation of Deleuze). In next week’s column I will build on another resonance which I am particularly interested in exploring- that of the practice of free improvisation and critical pedagogy and popular education- to argue that free improvisation should be central to a nomadic utopian education. *I would consider free improvisation to be an inaccessible ‘ideal type’. The ‘freedom’ of the players will always be constrained by various factors: their social histories, the music they have heard and are familiar with; any musical training they have had and so on. I also consider my arguments above to apply to improvised music that, perhaps, is not ‘free’ enough to be considered free improvisation. My argument applies insofar as the music in question is free (that is to say, they would apply in part to music that has a predetermined time signature but nothing else, and in an even smaller part to a traditionally composed piece which, of course, still allows musicians to display certain degrees of freedom of expression). I make no distinction between genres within free improvisation: I use the term to encompass music in any ‘tradition’. « Previous: In Theory | Autonomism: The future of activism?